This view provides two paths: basic input, advanced. Basic input allows you to manually enter coin issue information, which typically includes the year and mint mark. Advanced input allows you to specify more detailed information, all of which is optional. 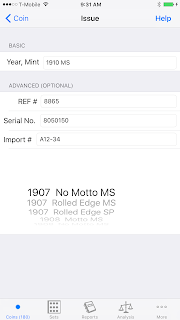 Best way to enter advanced input is to select the issue as listed for this Type in the scroller wheel displayed at the bottom of the view. 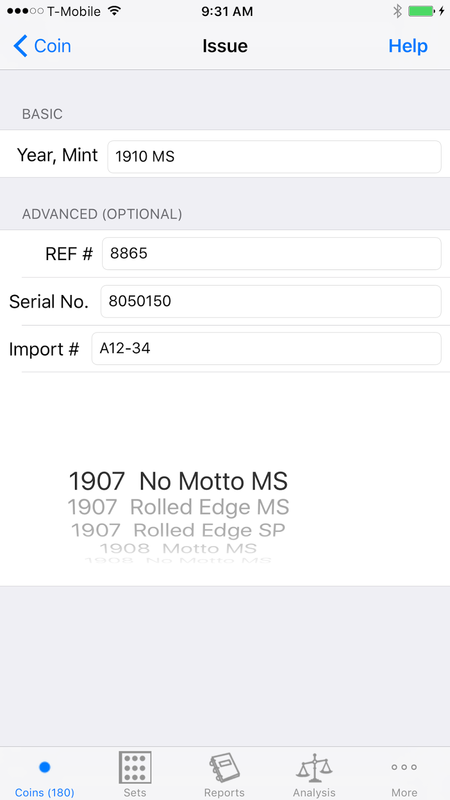 In the example screen, the scroller displays: "1907 No Motto MS". All advanced inputs are optional, however, the REF# is important as it enables integration with PCGS Coin Facts. If the coin has a REF#, the App can open PCGS's CoinFacts web page for that specific coin.